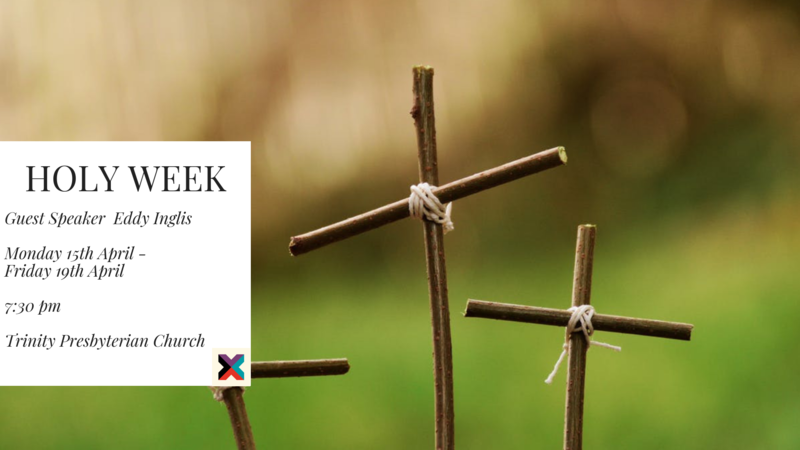 Please join us together with the Bangor Town Centre Churches to celebrate Holy Week in Trinity Presbyterian Church with guest speaker Eddy Inglis. Eddy Inglis was born in Dominica in the West Indies. His family moved to England when he was not quite three years of age, so he has limited recollections of life anywhere except in England. He grew up in North London. He took a place at Borough Road College in 1971 to train to be a religious education teacher in the secondary sector. It was here that he met his wife, Kathy. They have been married for 45 years. From the age of 21, having come to faith four years earlier, Eddy was taking services at churches in the London area. In 1978, he felt a specific call to preach full time and so resigned as a teacher and moved to Dukinfield in the North of England with his wife and three children under the age of five; this was in 1980. He worked at Crescent Road Congregational Church until 1993 and then he ministered in Rainhill, Merseyside, for 16 months but in January 1995 returned to Old Hall Congregational Church in Dukinfield – Crescent Road had a new minister by this time. Around 2006, Crescent Road and Old Hall churches held discussions about joining together and this happened a year later, which was a great victory for God’s Kingdom; Dukinfield Congregational Church was formed as a result and so the church operates on 2 sites. In July 2016, Eddy finished at the church but continued with his chaplaincy role at the local hospice which he had begun in 2009. He preaches wherever there is a need including Wigan, Salford, Stalybridge, Ashton, Cheshire and he regularly speaks at weekend conferences, breakfasts as well as doing residential work with teenagers. Eddy has 4 children and 12 grandchildren – as one of his daughters lives in Sydney, Australia he also preaches and teaches at ‘Restore’ church in Castle Hill, when he is visiting.